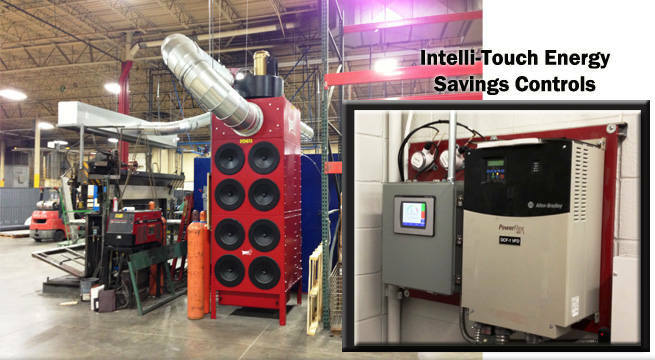 Intelli-Touch® Energy Savings Control Panel can give you big savings on energy and filter replacement...and it's only available from Micro Air®. 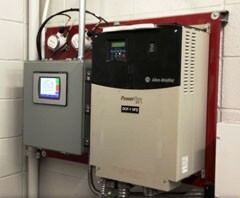 The touch-screen controls feature online monitoring and tracking of all pertinent electrical and performance data related to the dust collection system. With a built-in variable frequency drive and PLC, the system airflow can be adjusted at the touch of the screen or can be set to run at a constant CFM no matter what the system static pressure. Reduces energy consumption by using only the brake horsepower needed to maintain the set CFM. Soft start or slow ramp up eliminates surges or spikes in power consumption. Increases filter life. Reduces compressed air usage. Eliminates need for external dampers or slide gates in duct-work. Provides extra capacity to the blower, enabling it to run at up to 115% of normal speed. Allows for quieter operation through utilization of lower fan speeds. Automatically senses which units are operating in a multi-unit installation, providing only enough CFM for the units in operation. Application specific (plasma, laser, wood-working, grinding, weld smoke/fumes etc.) 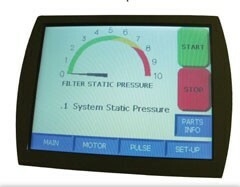 Built-in diagnostics tracks CFM, Static Pressure, amp draw, RPM, pulse settings, hours of operation.